The Helsinki City Theatre (HKT) in Finland’s capital city recently upgraded its Meyer Sound systems for full immersive audio capability, adding dozens of new loudspeakers along with D-Mitri digital audio platforms, Wild Tracks multichannel playback and Space Map 3D panning. 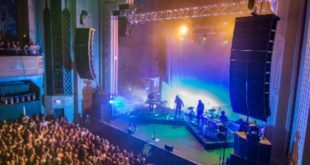 The system in the 947-seat Big Stage was expanded to a total of 124 Meyer Sound self-powered loudspeakers while a scaled-down system of almost 50 loudspeakers was deployed for the 347 seat Small Stage. 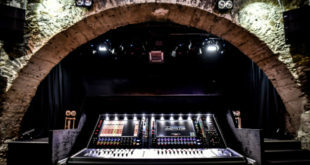 All 124 loudspeakers in the Big Stage system are individually addressable through dedicated outputs of the D-Mitri processors, which Nazimov said has been the theatre’s most dramatic upgrade. This allows complete control for creating immersive effects using Meyer Sound’s Space Map 3-D panning software, and "is pretty much what theatre sound designers have been dreaming for since the dawn of electronic sound in theatres, so the paradigm shift is not necessarily the loudspeaker system in itself but the control of it,” added Nazimov. The new installation does not compromise on the fundamentals of contemporary theatrical sound however. 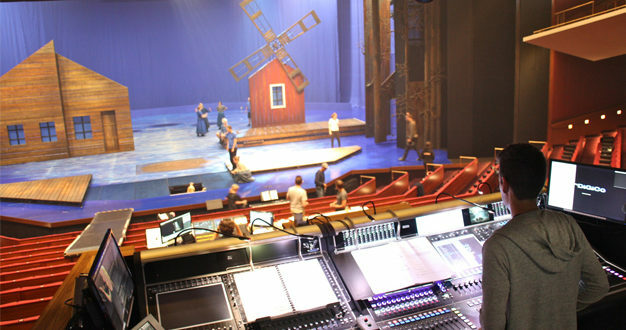 The main proscenium system employs the Broadway-standard A/B configuration, used by the theatre for decades, with two completely separate speaker systems to keep summing of signals in the acoustical domain. “The result is a much clearer and richer sound image,” Nazimov explained. The primary system for the Big Stage is anchored by 18 UPQ-1P loudspeakers with bass reinforcement from 3 900-LFC low frequency control elements (flown as a cardioid array) and a 1100-LFC element. The immersive surround system comprises 68 full-range Meyer Sound loudspeakers (28 UPJ-1P, 32 UPM-1P, 4 CQ-1, and 10 UP-4XP) plus four USW-1P subwoofers. 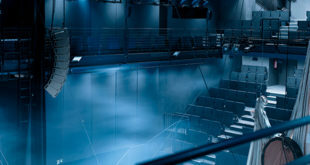 With a proper theatre system based on processing like D-Mitri, doing many things at the same time is made possible"
Design of the system was accomplished over a two year period, with Granlund Consulting’s Jan Holm collaborating with Nazimov and system integrator Studiotec of Helsinki. In the early stages of the project, Meyer Sound director of system optimisation, Bob McCarthy, also contributed to the design. Meyer Sound systems have been in continuous use at Helsinki City Theatre since 1986, when a complement of UPA-1 loudspeakers was brought in for an extended run of the musical Cats. “Product longevity and outstanding support are critical for theatere and these are two of the reasons we chose Meyer Sound,” Nazimov explained. A number of loudspeakers taken from the Big Stage have been repurposed to enable an expanded, immersive sound capability in the Small Stage auditorium. Assisting in design for this venue was Josè Gaudin, European technical support specialist at Meyer Sound. The Helsinki City Theatre stages about 20 new productions annually with a total of over 1,000 performances on six stages. The theatre’s current building was completed in 1967 and expanded with an annex in 1989.